Veteran diplomat Berhane Gebrekiristos (Amb. ), who served as Ethiopia's ambassador to the US and the EU was relieved form his latest governmental position of state minister of the Ministry of Foreign Minister (MoFA). 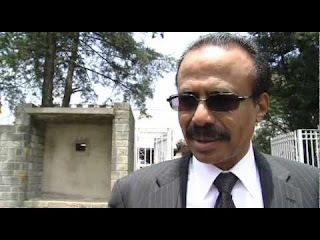 Berhane was replaced by another seasoned diplomat, Taye Atsekeselassie (Amb. ), former Director General of American Affairs at the ministry. By the same token, Prime Minister Hailemariam Dessalegn appointed Firehiwot Ayalew, former head of the Addis Ababa Communications Office and Werkeniesh Birru, former deputy head of the Oromia Cooperatives Agency to serve as deputy heads of the Government Communication Affairs Office (GCAO), which is currently headed by Getachew Reda. The new deputy heads replaced, Ewnetu Bilata, who is now appointed as Special Aide to the Prime Minster and Shimeles Kemal. Similarly, Yonas Yosef, the former mayor of Hawassa city, the capital city of Southern Regional State and Regassa Kefale, former Vice President of the Harari Regional State have also been appointed as new state ministers for MoFA. Kedir Dewano and Yinager Dessie (PhD), who has been appointed as the new Director of the National Planning Commission Hailemariam cabinet, were serving as state minsters at MoFA. Another ministry that got new state minsters is the Ministry of Federal Affairs and Pastoralist Development (MoFAPD). Mulugeta Wuletaw retained his position while Kayanaki Gezahegn, who was serving as Deputy Director of the Ethiopian Revenues and Customs Authority (ERCA) and Awol Argiso, who was previously working as an administrator at Awash Arba, will join Kassa Tekleberhan at MoFAPD. Wakgari Furi (PhD) has also been assigned to serve as state minister of the Ministry of Mines, Petroleum and Natural Gas, while the former state minister Alemu Sime (PhD), left for the Ministry of Industry under the same portfolio. Alemu also worked as head of the Oromia Regional State Investment Bureau.